Despite the overflow of humanity present for the congress at the royal palace, the hall where Keladry of Mimdelan walked was deserted. There were no servants to be seen. No echo of the footsteps, laughter, or talk that filled the sprawling residence sounded here, only Kel’s steps and the click of her dog’s claws on the stone floor. They made an interesting pair. The fourteen-year-old girl was big for her age, five feet nine inches tall, and dressed informally in breeches and shirt. Both were a dark green that emphasized the same color in her green-hazel eyes. Her dark boots were comfortable, not fashionable. On her belt hung a pouch and a black-hilted dagger in a plain black sheath. Her brown hair was cut to earlobe length. It framed a tanned face dusted with freckles across a delicate nose. Her mouth was full and decided. The dog, known as Jump, was barrel-chested, with slightly bowed forelegs. His small, triangular eyes were set deep in a head shaped like a heavy chisel. He was mostly white, but black splotches covered the end of his nose, his lone whole ear, and his rump; his tail plainly had been broken twice. 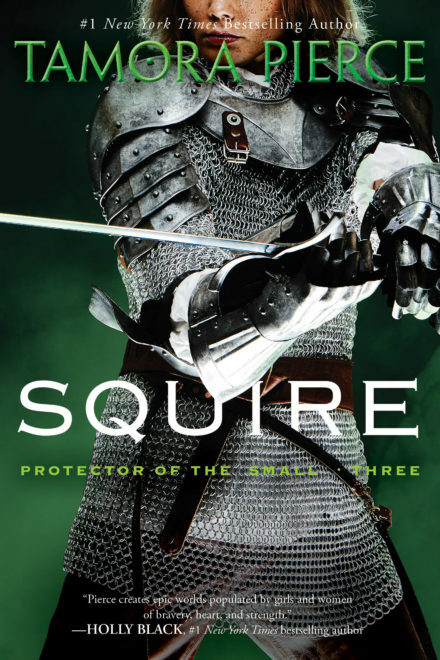 He looked like a battered foot soldier to Kel’s young squire, and he had proved his combat skills often. At the end of the hall stood a pair of wooden doors carved with a sun, the symbol of Mithros, god of law and war. They were ancient, the surfaces around the sun curved deep after centuries of polishing. Their handles were crude iron, as coarse as the fittings on a barn door. Kel stopped. Of the pages who had just passed the great examinations to become squires, she was the only one who had not come here before. Pages never came to this hall. Legend held that pages who visited the Chapel of the Ordeal never became squires: they were disgraced or killed. But once they were squires, the temptation to see the place where they would be tested on their fitness for knighthood was irresistible. Kel reached for the handle, and opened one door just enough to admit her and Jump. There were benches placed on either side of the room from the door to the altar. Kel slid onto one, glad to give her wobbly knees a rest. Jump sat in the aisle beside her. After her heart calmed, Kel inspected her surroundings. This chapel, focus of so many longings, was plain. The floor was gray stone flags; the benches were polished wood without ornament. Windows set high in the walls on either side were as stark as the room itself. Ahead was the altar. Here, at least, was decoration: gold candlesticks and an altar cloth that looked like gold chain mail. The sun disk on the wall behind it was also gold. Against the gray stone, the dark benches, and the wrought-iron cressets on the walls, the gold looked tawdry. The iron door to the right of the sun disk drew Kel’s eyes. There was the Chamber of the Ordeal. Generations of squires had entered it to experience something. None told what they saw; they were forbidden to speak of it. Whatever it was, it usually let squires return to the chapel to be knighted. The iron door seemed almost separate from the wall, more real than its surroundings. Kel got to her feet, hesitated, then went to it. Standing before the door, she felt a cold draft. Kel wet suddenly dry lips with her tongue. Jump whined. “I know what I’m doing,” she told her dog without conviction, and set her palm on the door. Kel looked up. Before her stood Sir Gareth the Younger, King Jonathan’s friend and adviser. Like Kel’s, his hands and sleeves were ink-stained. “I need you to find these.” He passed a slate to Kel, who took it, her throat tight with misery. “Before you finish up today, please. They should be in section eighty-eight.” He pointed to the far end of the room. She saw shelves, all stretching from floor to ceiling, all stuffed with books, scrolls, and documents. She looked at her tunic. 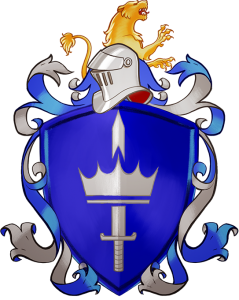 She wore the badge Fief Naxen, Sir Gareth’s home, with the white ring around it that indicated she served the heir to the fief. Her knight-master was a desk knight, not a warrior. —and tottered on the chapel’s flagstones. Her hands were numb with cold, her palms bright red where they had touched the Chamber door. Kel scowled at the iron door. “I’ll do my duty,” she told the thing, shivering. Jump whined again. He peered up at her, his tail awag in consolation. “I’m all right,” Kel reassured him, but she checked her hands for inkspots. The Chamber had made her live the thing she feared most just now, when no field knight had asked for her service. What if the Chamber knew? What if she was to spend the next four years copying out dry passages from drier records? Would she quit? Would paperwork do what other pages’ hostility had not—drive her back to Mindelan?